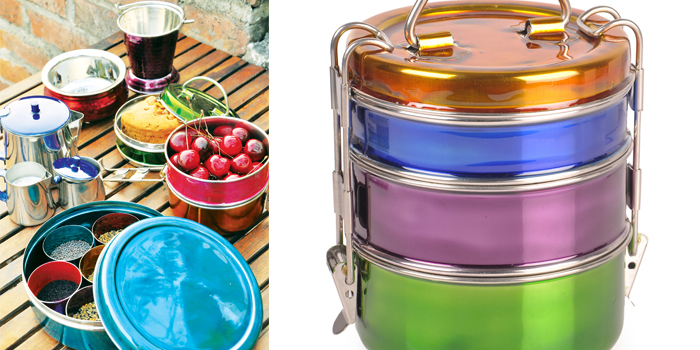 The ubiquitous steel lunch box has now got a modern twist. Enameled Kitchenware, a stunning new collection designed by Delhi-based Risham Chawla, is available on Jayporea��the online store that sells unusual jewellery, saris, art pieces and home decor items. Launched last July, the collection includes lunch boxes, kadais, assorted spoons, tea sets and bowls. Their bestseller a��masala dabbas. With most of the items in the collection already sold out, the response has been nothing short of impressive. Shilpa Sharma, co-founder of Jaypore, says the collection is meant to add a contemporary makeover to things that people use daily, like lunch boxes and tea sets. a�?Most of us have also moved on to plastic variants of the same. With the enamelled collection, we want to make steel more fashionable,a�? Sharma says. The coating is done by fusing glass on steel, using heat. We also like the look of their special-edition spice boxes designed by art-historian Vibhuti Sachdeva. Hand carved from wood and bronze, this beautifully conceptualised piece costs `8,800. Some of the items are multi-purpose. a�?For example, a masala dabba can be used by a jewellery designer to store beads and other stones. It all depends on how the customer looks at the product,a�? Sharma adds.This collection is available on their website and free shipping isA� available for purchase of Rs2,000 and above.